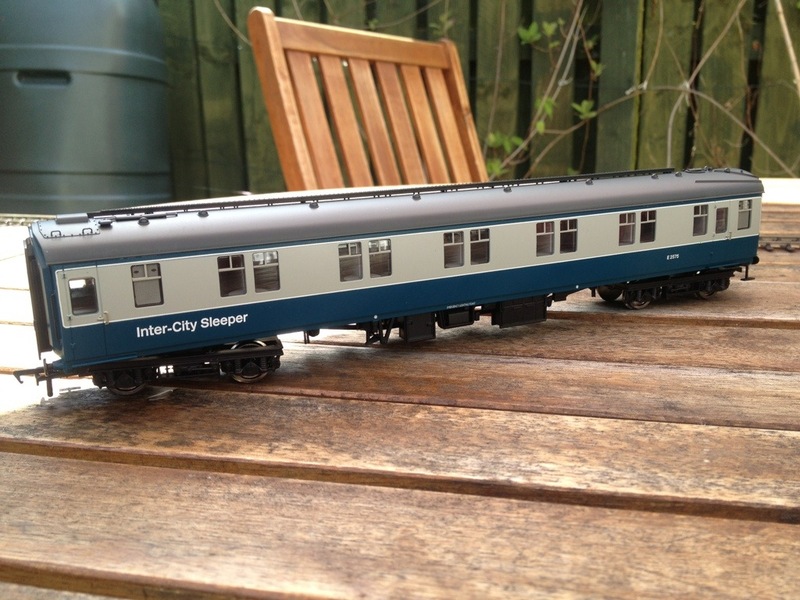 Newly arrived is Bachmann’s latest coaching stock release, the Mk1 SLSTP (sleeping car, second class). This model has been much anticipated by modellers of the 1958-83 period and as an overnight service using these vehicles operated over the Waverley, I number myself among those modellers. Two Mk1 sleepers formed the backbone of the last southbound service on the Waverley in January 1969, becoming embroiled in ‘The Last Stand’ at Newcastleton Station in 1969 where extraordinary scenes (quite fitting in the general backdrop of revolution and direct action protest that personified 1968-9!) saw disgruntled locals blockade the line in protest at its closure. Mk1 vehicles took over the St Pancras-Edinburgh ‘Pullman’ from 1960, the service previously being provided by LMS 12 wheelers. Bachmann pretty much own the BR Mk1 series in both 2mm and 4mm these days and as you’d expect, the vehicle meets the high standards we now expect from this logical and intelligent manufacturer. 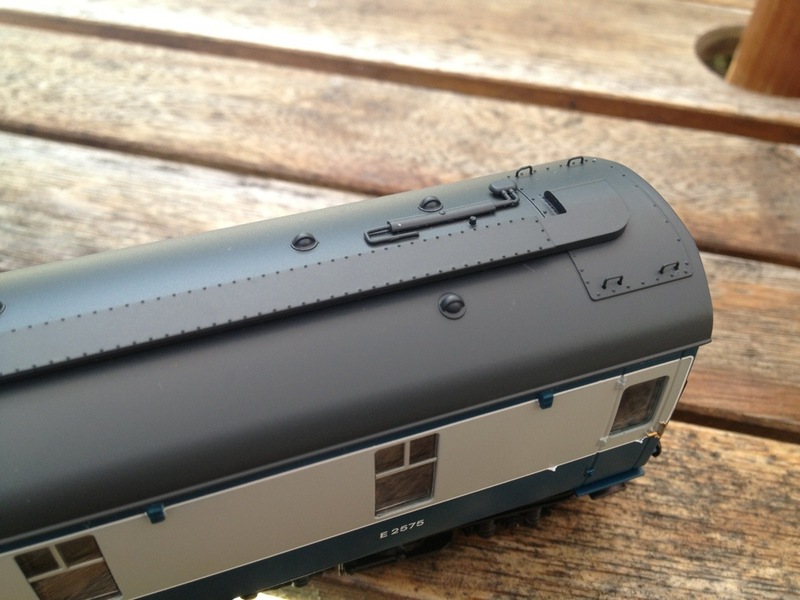 Long gone are the berm-like roof ribs seen on the early Mk1 releases as you can clearly see here. A fellow blogger, Bob Reid, certainly does hold greater knowledge of these vehicles and either of these sources will doubtless yield lots of suitable information. Bob’s own blog is linked via my Blogroll, I recommend you follow the link as he has plenty of interest to share. What’s evident from the photos is the overall finesse of the model and type-specific roof equipment appears well portrayed. The BR blue and grey livery is well applied although mine has a bit of a ‘wobble’ in the white lining above one end door. Hopefully, this is an isolated problem. Otherwise, it’s a nicely executed job though and Bachmann have taken to using a rather nice shade of rail blue which actually looks rather vibrant in the bright sunshine the British Isles are currently enjoying! 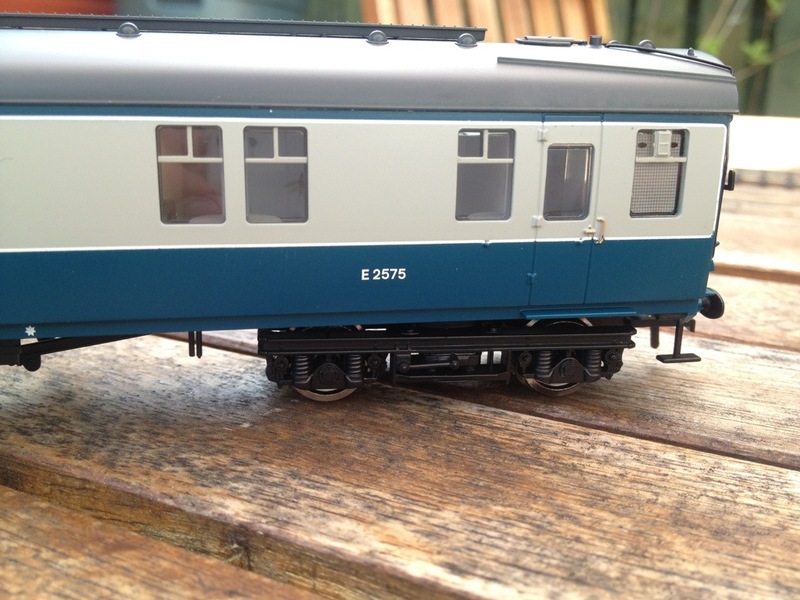 This vehicle will form part of my 1968 ‘Pullman’ and as I understand it, I may have to alter some details of the vehicle as the model apparently depicts a vehicle subject to equipment alterations in the 1970s. Some research work is called for! 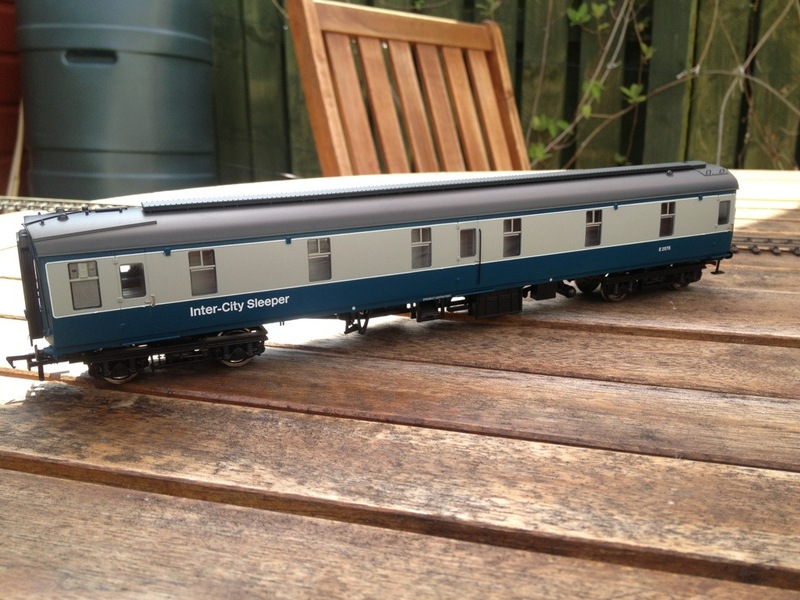 The model as supplied runs on nicely moulded B4 or B5 bogies. I’m not sufficiently well read to identify them individually as yet but I’m going to put that right. You can see that a pretty reasonable effort has been made to portray the cabin interiors though if you’re brave enough you could model some of them with blinds down. 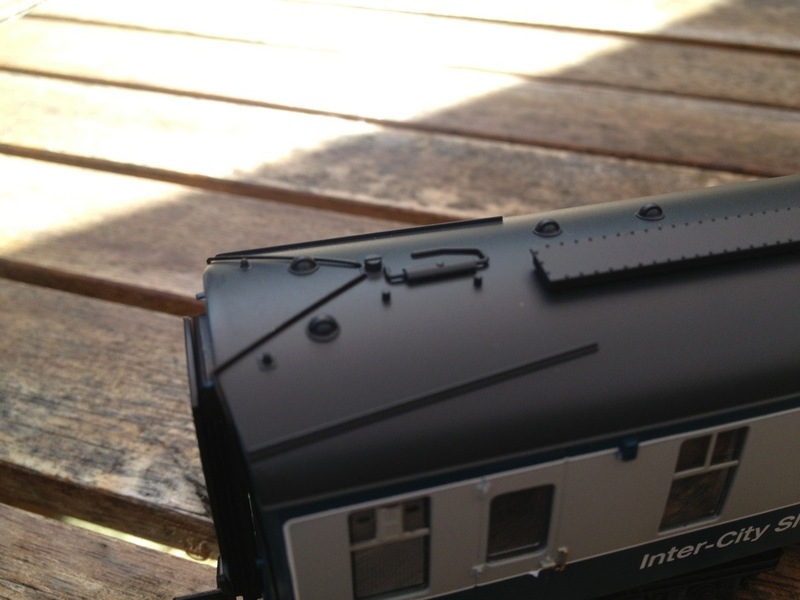 Also included is a small parts bag with drawbar details and Bachmann’s ‘hose’ type coupling. 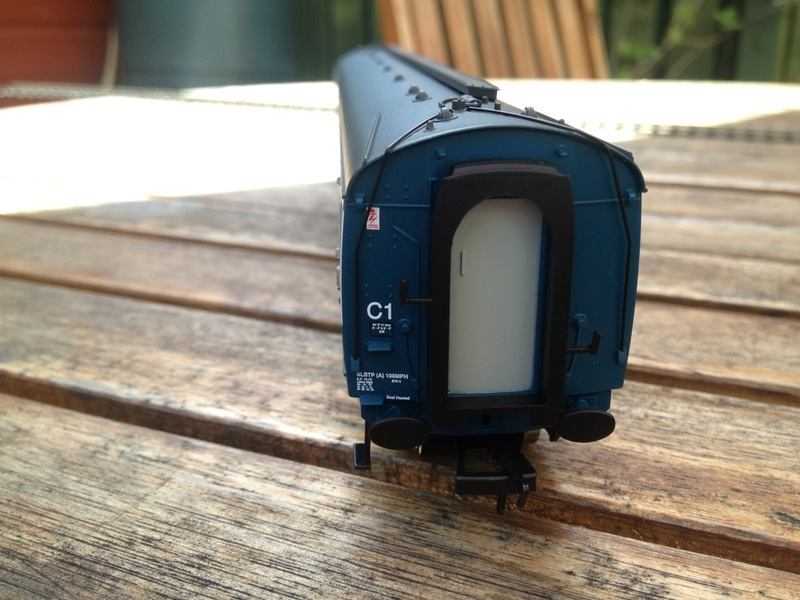 That then, is a short but honest guide to the latest vehicle in Bachmann’s popular Mk1 range. 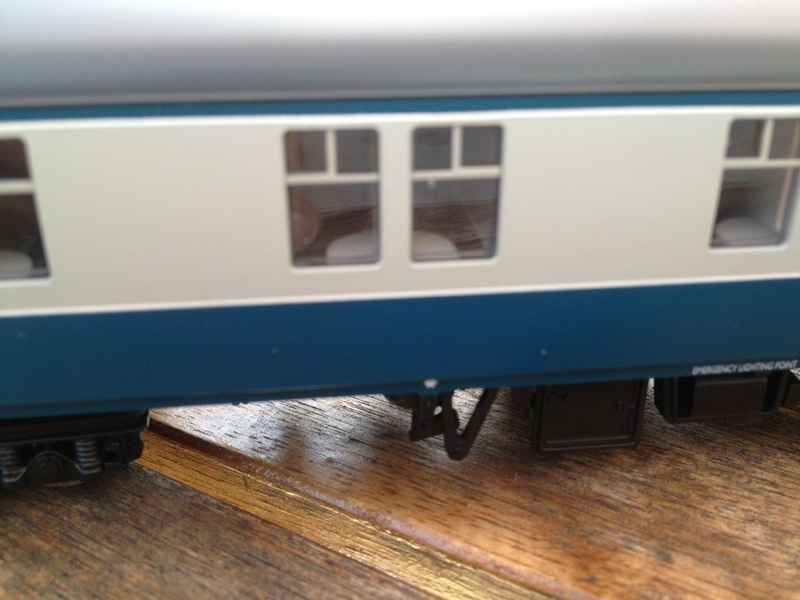 I’m also looking forward to the advent of their ex-LMS ‘Porthole’ stock, due soon also. Please watch this space and I’ll offer some thoughts and observations when one comes to hand! ← Diagram 1/044 Part 2.